We are one of the reputed Capillary Pipes and Tubes Exporters and Suppliers in India. The Stainless Steel Capillary Tubes that we bring forth in the industry is accessible in varying lengths, Size and grades. Their sizes range from 0.30 mm to 8.00 mm. They can be availed in thin, standard or heavy wall. Stainless Steel Capillary Pipes & Tubes are used in different applications of intra/extra cellular biology, separation sciences, hematology sampling and study, biotechnology, and biochemistry. We also offer copper capillary tube, Cu-DHP, copper nickel capillary tubing, brass capillary tube, cu capillary tube and capillary copper tube. These copper capillary tubes, dimensional tolerance for copper capillary tube, copper capillary pipes, cupro nickel capillary tube, hvac copper capillary tube are supplied in hard or annealed conditions. Our Cu capillary tubes are widely used as a restrictor in the domestic/industrial refrigerators, air-conditioners and heat exchangers. 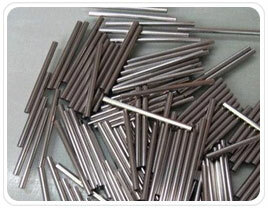 Our copper capillary tubes, 3mm od capillary tube, are produced according to EN 12450 standard. This way, these tubes are suitable to be used in liquid or gas equipment lines where rigorous control is required over the dimensional smoothing to guarantee constant flow rate. Our capillary copper tubes are compatible with the new refrigerant fluid. These tubes are used for Refrigeration & Air Conditioning & are as per ASTM B 360 having good thermal conductivity. N.B (a) Any intermediate size can be made on request. (b) All Sizes will be supplied in sufficiently hard condition and tested for the stiffness.